In a prior post I mentioned that the incidence of pulpal death following an indirect restorative procedure is approximately 13%. This number goes up to near 18% if the same tooth also had a buildup done as part of the process. The research is clear that the largest insult to the pulpal tissue is bacteria. Whether from caries, introduced into the tubules during preparation, or present from a leaking temporary restoration. Well fitting provisional margins are our best defense against leakage. Well fitting margins are the result of the addition of flowable to the bisacryl shell in the mouth. None of our matrices are accurate enough to hold the bisacryl against the margin during initial formation of the temp. In addition our trimming process will result in openings at the margin. Over the years this has been a challenging technique due to the color mismatch between the temporary material and possible incompatibility. Today many of the manufacturers have bisacryl and flowable designed to work together and be color compatible. For instance the new Venus Temp 2 was formulated to work with Venus flow so that margins can be sealed and temporaries repaired seamlessly. After trimming and shaping the provisional I use 50 micron aluminum oxide air abrasion around the margins. The next step is to coat the margin with dentin adhesive to act as an adhesive between the two layers. Leave this layer uncured. Dry the tooth thoroughly and run a ring of flow around the margins on the tooth. Seat the temporary restoration. Using a brush blend the flowable up over the surface of the temporary and cure. Remember to coat the tooth with Vaseline if you have a fresh composite core or filling in the prep. 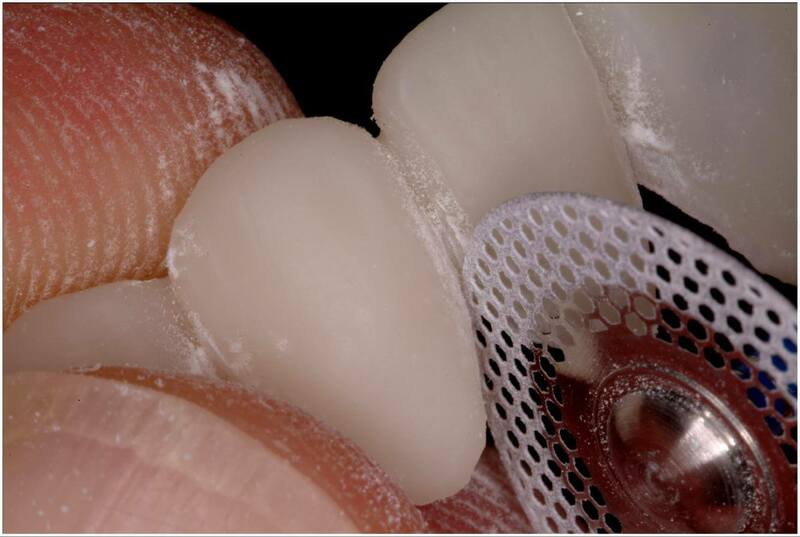 The flowable will stick to the bisacryl without dentin adhesive prior to the removal of the air inhibited layer. However, I find it nearly impossible to accurately reseat until trimming and shaping have occurred. I get far greater accuracy if the last step before polishing is margin adaptation. Great post as always. Would this method work in an upper molar where there is limited access and the margins are typically subgingival interproximally. Any issues with curing the flowable completely? I do use this technique every where in the arch. I ;eave my primary cord in place until the provisional s cemented top block temporary cement from going into the sulcus and holding retraction until the temp is done. It also controls bleeding. Make sure you wipe away any flowable that goes gingival to the margin or pools in the embrasure area with a micro brush before you cure. The only challenge I have had is when you cure if you lock it into an embrasure.